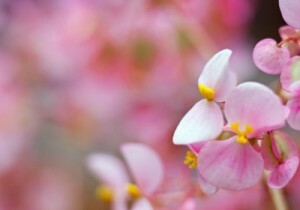 Note: Begonia is a genus in the flowering plant family Begoniaceae and is a perennial. “Begonia” is the common name as well as the generic name for all members of the genus. The species are terrestrial (sometimes epiphytic) herbs or undershrubs and occur in subtropical and tropical moist climates, in South and Central America, Africa and southern Asia. Terrestrial species in the wild are commonly upright-stemmed, rhizomatous, or tuberous. The plants are monoecious, with unisexual male and female flowers occurring separately on the same plant, the male containing numerous stamens, the female having a large inferior ovary and two to four branched or twisted stigmas. In most species the fruit is a winged capsule containing numerous minute seeds, although baccate fruits are also known. Colour: Depending upon type, you can find red, white, pink,or yellow varieties. All flowers have a bright yellow eye (center). 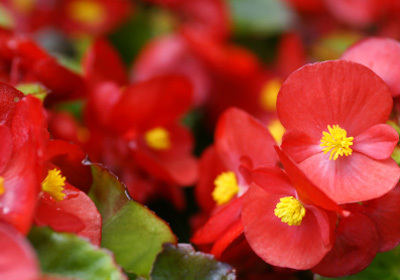 Flowering time: Many begonias will grow and flower year-round but tuberous begonias usually have a dormant period, during which the tubers can be stored in a cool and dry place. 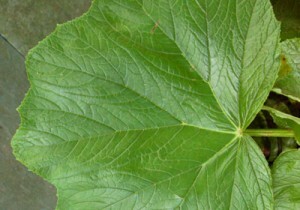 Foliage description: The leaves, which are often large are usually asymmetric (unequal-sided). Foliage colour: Variously marked or variegated. Light preference: Most Begonias are forest understory plants and require bright shade; few will tolerate full sun, especially in warmer climates. Temperature: Begoinias require warm temperatures. 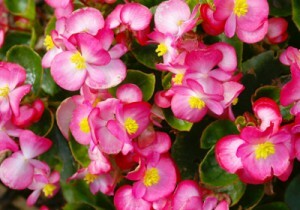 Soil requirements: Begonias require a well-drained growing medium. Fertilisation: Add a general purpose fertilizer once a month. For houseplants and container plants, give them a dose of liquid fertilizer once a month instead dry fertilizer. Insects: Few or no problems. Diseases: Few or no problems. Other notes: Begonias like attention. Remove dead flowers, leaves, and stems. Trim off long stems to help retain it’s compact shape. A little care will pay you back with lusher foliage and more blooms. References / Bibliography: Wikipedia and The Gardeners Network.